On Thursday I received many e-mails notifying me of the joint statement from the four associations expressing “the entire professions lack of confidence in its regulation”. I am absolutely delighted the associations have made this statement. Which confirms the findings of the 2005 survey which found 77% of the profession had no confidence in the GCC. Peter Dixon claimed this survey was “questionable” but never put it to the test and when I put the findings in my election manifesto the returning officer deleted the part. The returning officer for the GCC elections just happened to be the GCCs Chief Executive Margaret Coats who would not have anything bad said about her beloved General Chiropractic Council. Whether the associations can put their differences behind them for the sake of the profession will be the key in getting better regulation, Its ironic this has happened only a few days after Michael Pedigo’s passing. Contrary to what many would like to believe I am not against regulation. However I believe bad regulation is worse than no regulation at all.I could point the finger of blame at Peter Dixon, Christina Cunliffe or the jobsworths appointed onto the reformed GCC in 2009. However one person stands head and shoulders above everyone in dragging the profession down and its the GCC chief executive Margaret Coats. She will say she has only followed the wishes of council, which is the wishes of the chiropractic profession seeing we have statutory self regulation. The fact so few were willing to stand up to her speaks volumes about the type of person she is. The writing was on the wall when GCC employee Maxine White resigned her position after 3 months alleging Coats was a bully. Not for the first times the allegations were brushed under the carpet after council member Martin Caple conducted his investigation and gave Coats a clean bill of health without speaking to Maxine. The cover up of the rogue activities of her Coats deputy Greg Price and the fact he was given a reference to work at another health regulator should have sent bells ringing. Coats was able to control GCC members by doing things like bringing in civil servant Graham Donald into the GCC after his retirement (the man who dealt with complaints about the GCC for the Privy Council) to find out what the privy council knew from other council members. Coats other source of control were the “anonymous” assessment forms council members did on each other. Coats decided who would assesses who and gleaned much information on where loyalties lay on the basis of those forms. I suspected they were not “anonymous” and she was using them for her own ends. Sure enough I got an e-mail when I did not sent mine in when she was trying to establish my relations ship with Graham Heale, Marc Cashley and Carl Lago. Dixon and Coats have just recently completed their investigation into their use of private investigators and how the other conducted themselves which I hope will finally bring about their down fall. Much will depend on how the Associations conduct themselves and make their case against Coats. The agreement between the associations is only the first step and it must endure for the future of the profession, that may rise from the ashes that the GCC (not the skeptics) have created. 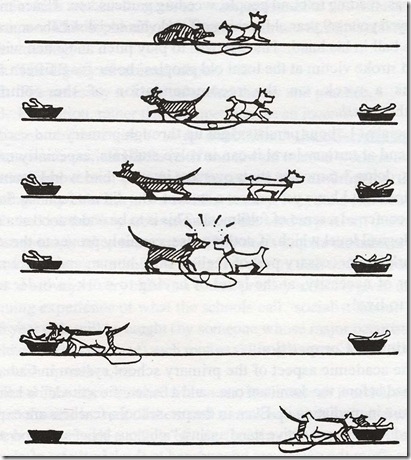 In Cuba the first lesson taught on the first day of primary school is that co-operation is better than competition (see below). I hope the chiropractic profession will take that on board now. Now the end of Mrs Coats’ reign of terror draws closer as her retirement date approaches, the question of who will suceed her needs to be asked. Will the interim CEO/Registrar seek a permanent position at Wicklow St? Or will some other worthy soul take up the challenge? I have heard that there is no bar to a chiropractor being Registrar. Would Peter Dixon be happy to have David Byfield, Christina Cunliffe or Alan Breen running the GCC Office? Perhaps if we can convince the Alliance to pull back on ICA best practices document, we will get an Alliance of all 4 Associations as I think it is the main sticking point. (This may be difficult with the SCA, with a prominent and very well known Scottish Chiro getting ICA Chiro of the Year a few years ago). I, and most chiropractors even the medically orientated ones dont have a problem with subluxation as a model for treating mechanical back pain, I really dont. Noone has come up with anything better or with more evidence. Its not great, and it is largely untestable as a model, but if you forget blinded trials, motion palpation with patient feedback, ie “OUCH” when you push on it isnt that bad as a mechanism for finding Harold. I dont like the term Subluxation because of its ambiguity, and its misuse as a promotional tool. I prefer calling it Harold its nice and friendly, (I can see you smiling, subluxation doesnt do that). I do remain unconvinced (as do many other Chiropractors) that as an entity Harold causes “other health concerns”. I am sure that is a difference most people can live with for the greater good. Subluxation is not the be all and end all of what we do, you know that as well as I do. The Alliance document should reflect that, in fact I really like the Louis Sportelli Florida Chiro Assoc definition (althought the bit on not using drugs or surgery could be removed if we ever get prescribing rights before anyone hits me with that stick… again. Also its far better we focus on what we do not what we dont do). We dont all have to agree on everything in an Alliance, a point that was made at the BCA conference, but we cant sign up to a document by which the UK profession could be ridiculed. Now if I ditch Disease, will you please ditch medipractor, its as derogitry as Chiroquacktor. We all trained as Chiropractors, Science Art and Philosphy, but what we got out of our training is different for each of us, I like the Science, and Art of Adjusting bit, but thought the Philosophy bit was nonsense, my opinion. Others connect with the Vitalistic Philosphy that is fine with me, it just isnt me. Some GP’s use acupuncture or homeopathy are they Medcial Quacktors, or Ducktors of Medicine? You have been busy today. I think you do raise valid points about the ICA guidelines. I raised this point in a post http://www.chiropracticlive.com/?p=980 a few weeks ago. If I am honest it was a rhetorical question however having spoken to Rishi and representatives of the Alliance I would say it was a mistake for them to use that document. I have not had time to post about it and apologise to Rishi. The fact is IMER guidelines are not a requirement of the GCC they are a legal requirement. When I cam off the register I could continue to practice chiropractic but could no longer make a decision to take an x-ray. A while ago I was asked to look at a case coming before the GCC the chiropractor x-rayed all his patients, no evidence of filters protection or collimation. The tragedy is x-rays are still all many chiropractors have to distinguish themselves from other manual therapists and I have always found it amusing that the taking of x-rays was one of the major bones of contention preventing McTimoney college getting ECCE accreditation. Any chiropractic document using the word disease is an embarrassment to the chiropractic profession for two reason. Disease is a word that is constantly used against subluxation chiropractors, http://www.chiropracticlive.com/?p=567 BJ Palmer used a play on the word dis-ease to explain the purpose of correcting the subluxation. BJ Palmer made clear “Disease” is a term “used by physicians for sickness. To them it is an entity and is worthy of a name hence diagnosis”. And Dis-ease as “a chiropractic term meaning not having ease. I have criticised many chiropractors like Eugene for using the term disease in relation to the way I and traditional chiropractors practice any chiropractor or organisation who would use the term in relation to the practice of chiropractic has there head firmly placed where the sun does not shine if they can not see the damage using the term does. I have been very critical of the BCA and “medipractors” for the way they rounded on Simon Singh and defended the chiropractic profession. But I can not help feeling it may have been a whole lot worse if the Alliance had been the ones defending the profession. Yes this is only a small part of the ICA document, but those bits undermines much of the defence of traditional chiropractic as not treating conditions but focusing on correcting subluxation / spinal dysfunction to optimise wellbeing. This discussion illustrates the difficulty in regulating a profession as diverse as chiropractic where the practitioners have as much animosity towards each other as they have towards the sceptics I see nothing wrong in the way Eugene practices, his motivation is the same as mine to help people. Where we differ majorly is that Eugenes believes our clients would benefit from us prescribing or that drugs are part of chiropractic practice. Should he be hanged drawn and quartered for that? I hope not, because the fact remains chiropractic traditionalists and advocates of the ICA guidelines have not been able to convince him otherwise. I respect Eugen for having had the courage to stand up alone and express his views on prescribing six years ago, knowing full well the mouthful he would get from the likes of me and little support from the BCA. If there were just a few more chiropractors out there with Eugenes courage, or Richard Rumarry http://www.chiropracticlive.com/?m=200007 Margaret Coats would not have been allowed to damage the chiropractic profession the way she has done over the last fifteen years. AS I said there is more to “coming together” than sending a letter with four signatures on it. I am not going to apologise for having a goal of reducing pain and restoring function, that is our most important role. That and diagnosing and referring serious medical conditions for appropriate treatment as chiropractors (Salter Harris fracture distal tibia yesteday) GP Dx. sprained ankle. The model, techniques, and philosophy we use dont matter, as long as it in in the best interests of the patient, and has a realistic chance of helping. Asking me to retrain is petty, or perhaps we should all do exactly what you do Paul. Chiroquacktors and medipractors, if we persist in name calling, should be united behind providing treatment in the best interests of the patient not mainatining us and them status between chiropractic and medicine. Do I moan when yet another unscientific technique comes along KST (Koren specific Technique) for example, totally made up, utterly fablicated, cos it worked on his wife. No evidence, and yet unchallenged, and sadly people opt to learn it, how stupid is that? But “my bad” for suggesting chiropractors should be trained to a standard where they can choose whether or not to prescribe based on the patients best interest, their own principals as chiroprctors, and an adequate level of training. Far better this in my opinion, than from an ill informed point of dogma. We moan when ill informed skeptics who know very little about chiropractic training challenge our profession. We call them bigots and bullies (and they are). Yet when we choose to remain ill informed in Pharmacology, but suggest prescribing is a bad idea, and conversely, we can advise on OTC meds, we are not bigots, how does that work? …Best practice for uncomplicated axial pain, involves 25 visits in 8 weeks. …Complicated by reduced cervical lordosis 85 visits in 28 weeks. Your Alliance signed up to the ICA “bent practices” document not mine. Yes John it is true in any compromise between between good and evil it is only evil that will profit. I am sure most decent and honest chiropractors find these parts of the ICA document both farcical and abhorrent and wholly inapprpriate for chiropractic in the UK. If you do, ask your Association why is this acceptable. Why not ask the GCC if this is this an appropriate amount of treatment and appropriate use of xrays. Lobby your Association to distance itself from the big stick the ICA and Alliance has given the skeptics to beat us with. I cant think of another healthcare profession that would choose to be lead by a group who advocate breaking treatment and x-ray guidelines laid down by their registering body, no matter what you think of them. Intelligent replies more than welcome. This is a bit long but worth the read. It comes from the Florida Chiropractic Associations web site. It allows all of to be what we want to be. I would say if you can’t exist under it’s definition,and allow others to do so as well, you’re are most likely in the wrong profession. …interviews and consults with the patient, employing every measure of observation that will more substantially profile the patient. …conducts a systematic physical, neurologic and orthopedic examination, using methods, techniques and instruments standard with all health professionals. He/She also includes a postural and spinal analysis unique to chiropractic diagnosis. …performs or prescribes patient tests, measurements and evaluations of health status, impairment and disabilities in establishing or revising treatment and preventive programs. …arrives at a differential diagnosis using diagnostic roentgenology and standard and special laboratory procedures and tests. …corrects, reduces, mobilizes or immobilizes particular abnormalities, particularly of the spine and pelvis, to normalize structural and functional relationships and relieve attendant neurologic, muscular and vascular disturbances. These methods do not include the use of prescription drugs or surgery, thus avoiding the dangers therein. …when deemed necessary, prescribes dietary regimens and nutritional supplements to prevent the onset or assuage the existence of some types of dysfunction of the nervous system and other tissues. …frequently uses physiotherapeutic methods and procedures as adjunctive therapy to enhance reception to and the effects of the chiropractic adjustments. …evaluates the effects of therapy at various intensities and duration during case management and revises therapy to achieve maximum results. …often uses first aid, taping and strapping in treating injuries of the extremities, and supportive collars, braces or corsets may also be used during recuperation to assist healing and strengthening. …provides counseling in such areas as dietary habits, physical and mental attitudes affecting health, personal sanitation, occupational safety, posture, rest, work, rehabilitative exercises, health habits and many other activities of daily living that would enhance the effects of chiropractic health care. …orients, instructs, directs and evaluates work activities of administrative assistants and paraprofessional clinical assistants. …may plan and conduct lectures and training programs on health care related subjects for chiropractic staff, students, patients, community groups and industrial plants. …may plan, develop or participate in research programs and/or in the development of technical articles for publication. …may limit practice to a specialized area of interest, such as orthopedics or diagnostic roentgenology and attain diplomate status through certified postgraduate and evaluation. Whilst the language used is unnecessary I think what Paul is getting at is that manual medicine and chiropractic are not interchangeable terms – they are separate professions. Eugene although professing to be a chiropractor, practices manipulative therapy toward pain relief and wishes to be allowed medicate his patients toward the same end goal – pain relief. He refuses to either consider or use chiropractic to provide fuller healthcare to his community. This is fine and is of course his choice. The problem lies in that Eugene wishes then for chiropractic to turn around his choice and become a manipulative therapy and part of manual medicine. Apologists crying unity do not help the problem and further muddy the waters rather than stating clearly where the problem lies. Wow teddy and pram springs to mind. People taking sides is not what we need just now, the profession working together, is. I think Eugene finally moving to the Dark side would not initiate a schism – in fact it would invite clarification if a group of those preferring the vocation of manual medicine moved aside from our profession and with them the likes of you who keep excusing them. There are many opinions in chiropractic, not just yours. The chiropractic profession has finally come together to take in the GCC. 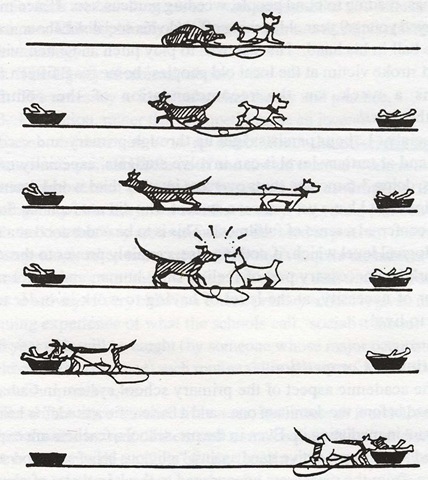 So please don’t initiate schisms based on one side or another. Eugene please retrain toward a career that you like instead of hijacking the profession we love. Regulation a disaster when the philosophy of chiropractic was derided!! What nonsense. I deride it regularly because it is meaningless mumbo jumbo. The old BCA leaflet “we manipulate the spine to release the bodies natural healing ability” or some such rubbish, makes me want to break out the josticks and do some yoga. CAP checking of the leaflets was worthwhile in that regard. In day to day practice philosophy does nothing, and does not change outcomes, you do what get patients better quickest. Regulation was a great thing for one reason only… VAT. And as an added bonus we now we can protect the public from claims of treating, wait for it… sprained ankles, upper back pain, and golfers elbow. And Chiropractic being “suitable for all ages” no no no. You must be born on 3rd Jan and be 44 years old, doesnt work for anyone else, dont you know. Chiropractors want the same level playing field as other healthcare workers. Physio’s advertising code “must be Professionally Restrained” thats it. I sincerely hope we are all one day HPC registered to an ECCE standard and that McT get ECCE accreditation to stop all the squabbling. As for the Alliance of Chiropractors they sign up to ICA best practice document. Read that and weep! I should point out “Barney” is a former member of the council. So if you ever meet a chiropractic member of council ask them why they did not challenge Coats, why dont you resign to draw attention to the failure of Coats and Dixon. Why are you still in there, what are you doing? Totally agree Rod. Statutory regulation was a disaster from the very beginning (literally the third meeting) when a paper presented to Council on the philosophy of chiropractic was derided. consistently refused to place requested items on Council agendas. despite at least three requests from various members of Council to discuss his behaviour and its risk to Council, it was disallowed on the spurious notion that it violated data protection! !- in fact his departure was NEVER recorded on ANY GCC agenda. Agreed Richard – perhaps throw Kockdraki on the queen card – any chance of getting them made up in time for Christmas? The regulator is an embarrassment, Greg Price was a disgrace. Coates should do the decent thing and resign; we could hold the retirement do in a phone box. Another chiropractor letting the side down. It a joker Stefaan and thats my card. The chiropractic profession needs a few queens though, the profession has far to many hetrosexual men in suits for my liking. Can I be the fool? Pretty please? Coats would be the ace of spades, Dixon the Ace of clubs, Cunliffe Ace of hearts ( loving to your face treacherous behind your back) , and Judith Worthington, the ace of Diamonds (Posh bird). you’re a breath of fresh air and I enjoyed the laughing aloud – thank you! @ Richard – why just Coats and not that slimey Dixon? @ Richard Supposing there is someone waiting in the wings, hungry for power, who will prove to be rather more menacing as a super-power, given the chance? The general consensus seems to be that the change will be positive. Dixon went to the three presidents asking them to cooperate Framk and Ross refused. Tony forwarded my e-mail which was the evidence they used against me. The also had an e-mail which Steven Williams had passed on to Peter.When I e-mailed Tony Metcalfe telling him what was going on, I did not expect him to get back to me and say, Richard we have to do something, but I was curious how he would respond as President of the BCA because he was one of the principle founder members of the GCC. Framk an AECC graduate also resigned from the register. Tony Metcalfe was the guy who came down to AECC in 1995 to reassure AEEC student about their concerns about registration. He assured about 300 in the hall that McTimoney had agreed to go full time within five years and had agreed to ECCE being the gold standard. We now know no such agreement was in place, part time was the USP for McTimoney and they had no intention of changing the course structure. So the BCA leaders (Peter Dixon 1995-99) told members the McTims had gone back on the deal when nothing had been agreed. The ball is firmly in the professions court now and I hope to start blogging about health and wellbeing in the new year and the associations will look after the interests of their members regarding regulatory matters. I believe it would be a good idea to have a a separate body for defending chiropractors on the lines of the Medical Defence Union http://www.the-mdu.com who would also deal with insurance matters. The existing association would concentrate on promoting their particular brand of chiropractic to the public or merging. When Coats and Dixon go, I will probably apply to go back on the Register. I get on well with most in the profession, and while I piss many off, I am honest and have integrity and I sure most people believe that is more important than towing party lines. I was referring only to the suggestion you had made that the GCC and the BCA had done a deal in respect of the current mass complaints. I can’t see that there would have been any benefit, to anyone, in bringing down the GCC. However, independent of the shameful treatment you were subjected to by the GCC, it is apparent that the management at the GCC has been less than perfect. Regulation is a good thing but what we need is realistic and fair regulation. I think that the chiropractic profession has been let down by its representatives for a very long time in the UK. Collusion?? Did Tony Metcalfe provide the evidence to Peter Dixon to have me removed from Council, yes Did the BCA sit back and allow Coats to do her thing, yes. 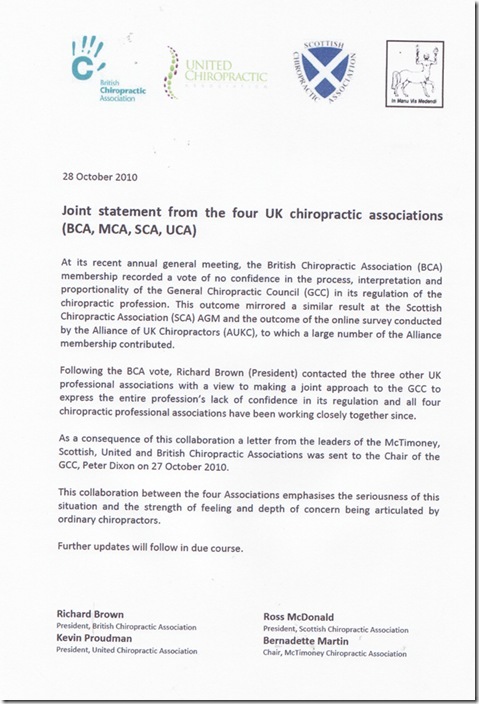 Did the BCA hope the GCC would help bring about their vision of UK chiropractic, yes. 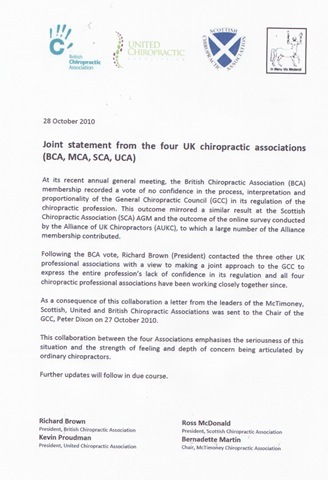 People tell me Richard Brown is a good man and I have been unfair to him, however in my opinion he was way too close to the prosecution of GCC cases to be completely objective as the representative of BCA chiropractors. Yes, I believed that the BCA had made a deal with the GCC to avoid public hearings, now it would appear they did not, in which case I dont understand why they advised their members to go for papers because the only people it benefits are the GCC, if Bob Crow or Richard Lanigan were representing BCA members we would have called the GCC’s bluff. There are three stake holders with different interests in relation to the mass complaints, the members, the association, and the GCC. I believe a presidents first duty is to the members he represents and I am concerned that members who need legal advice have been asked to sign a paper promising not to sue the association for their advice in relation to charges being brought by the GCC. Not forgetting the BCA insurance or lack of it as members have found out. So in answer to you question I dont think they sat down and colluded with Margaret Coats and Peter Dixon, I do thing they let their members down as did the UCA and MCA. The GCC did not have the money to have 700 hearings and would have had to call in the Privy council, in politics you pick your battles and the only thing the chiropractic profession has that the GCC need is money. Do you agree that now might be a good time to acknowledge that there has in fact not been any collusion between BCA and the GCC? I dont disagree with anything you have said, I do the same. Unfortunately they get misused and misunderstood, yes they make life easier, however when someone complaints to a regulator because they feel they have been ripped off. Who do you blame the chiropractor for not explaining properly or the patient for not listening or the chiropractor who may have been trying it on. Either way there is plenty of room for misunderstanding which the profession does not need right now. I was the only one on the GCC council who supported outlawing the practice, because it invites complaints. If you think someone needs to come x number of times tell them how much its going to cost and if they stop coming as soon as the pain has gone, so be it. If the patient still has the choice to pay visit per visit, would it not be OK to give patients in need of a lot of care a possibility to have a serious reduced pound visit average? It helps them, it helps me, I do not force them to buy and if they want to terminate care I return the money not used. Is this really that bad? Please give me feed-back. You get the government you elect and in most elections 40% of the electorate don’t participate and represent the biggest group in elections. So if you have a president you don’t agree with you have to ask who elected him and if the majority elected him on a biomedical agenda for chiropractic you have a problem, because if the majority of Scandinavians wish to embrace the biomedical model its because traditional chiropractors have not bothered to make their case in the political arena and allowed others to dominate. You can not blame people for taking advantage of their political inactivity. Many of these chiropractors will say they are too busy to get involved in politics and if that’s their attitude they deserve the politicians they have representing their views. To be fair I don’t believe the profession is as polarised in Scandinavia as it is in the UK and having lived in Denmark and Norway I would say Scandies are much more pragmatic than the British. One thing has struck me in all of this controversy surrounding chiropractic is how invisible the representatives of traditional chiropractic have been. Yes the BCA were ill advised and not very competent but at least they tried to defend the chiropractic profession. The McTimoney association cut and ran advising all members to remove their websites which if anything encouraged the sceptics and in my view was ever bit as idiotic as the BCA’s decision to sue Simon Singh. The UCA changed their websites discreetly removing mention of anything which might offend the skeptics and Margaret Coats. Bearing in mind much of what Simon was saying was intended for UCA members they needed to put their heads above the parapet, unfortunately they choose not to. For me the only association to come out of all of this with any credit is the smallest association the Scotish Chiropractic Association. Hopefully chiropractors have learned that they have to work together and focus on what they have in common rather than their differences. I have never criticised David Byfield et al for wanting to focus on treating back pain. I have criticised them for telling me that’s how I should practice and his desire to marginalise those who would not follow his “scientific” approach to practice which we now know is not as straight forward as they would have the profession believe. However if I was asked to change one thing that I believed would to focus chiropractors on the principals of chiropractic in moving forward, it would be that chiropractors stop using prepayment schemes to improve patient compliance. These schemes are open to abuse and it’s a convenient way of covering up ones inability to explain what chiropractic is and how it can help people, which has to be addressed if the profession is to progress. I offer ten visits at £340, so I am not saying prepayments are unethical, I am saying they are open to abuse and can easily be misinterpreted by colleagues and patients and would be an unimportant diversion in the negotiations facing the profession in the months ahead. Your blogg Richard has been excellent in keeping people inside and outside of UK up to date what is happening there. We in other European countries can learn a lot from the experience in UK. Where I practice (a northern european country) it seams the spirit of the head of the association is on the same page as Coats. Do you know has Margaret Coats ever been adjusted? Is she under anyones care? Would be interesting to know if she actually is or has been a chiropractic patient. We can only hope though the future looks better than it did a few months ago.